When Darnell L. Moore was fourteen, three boys from his neighborhood tried to set him on fire. They cornered him while he was walking home from school, harassed him because they thought he was gay, and poured a jug of gasoline on him. He escaped, but just barely. It wasn't the last time he would face death. What happens to the black boys who come of age in neglected, heavily policed, and economically desperate cities that the War on Drugs and mass incarceration have created? How do they learn to live, love, and grow up? Where should they turn when history rejects their very existence? Darnell explores these questions in his memoir NO ASHES IN THE FIRE: COMING OF AGE BLACK AND FREE IN AMERICA. In bold and inspiring prose, Darnell traces his life from his childhood in Camden, a city scarred by uprisings and repression; to his search for intimacy in the gay neighborhoods of Philadelphia; and, finally, to the movements in Newark, Brooklyn, and Ferguson where he found his voice and his calling as a leading organizer with Black Lives Matter, a movement that recognized him and insisted that his life counted. Moore reminds us that liberation is possible if we commit ourselves to fighting for it, and if we dream and create futures where those who survive on society's edges can thrive. 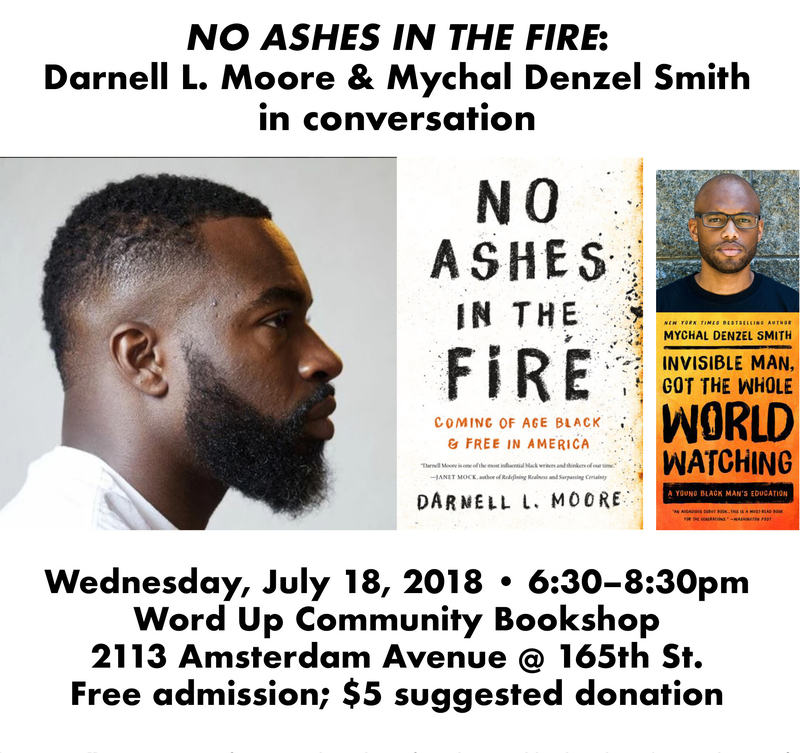 At Word Up, Darnell will be in conversation with Mychal Denzel Smith, New York Times–bestselling author of Invisible Man, Got the Whole World Watching: A Young Black Man's Education. Books will be available for sale at the bookshop, and are also available online on our website: https://www.wordupbooks.com/book/9781568589480. The event will be introduced by Memphis Washington, founder of the Q&T Meetup at Word Up.